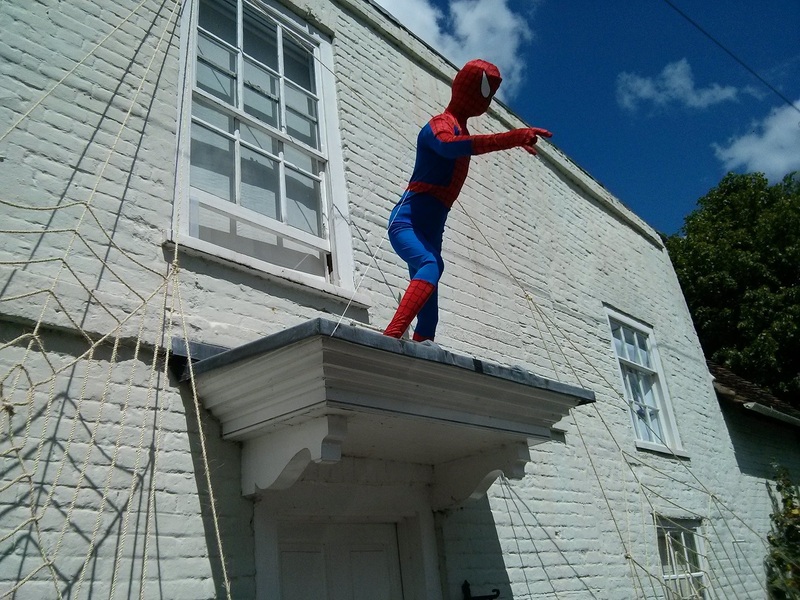 Spiderman on a porch roof. No reason. Now I can’t say my life is stressful in the sense that I do not have to file reports, meet press deadlines, create spreadsheets for inexplicable data, worry whether HR are monitoring ‘all’ email attachments , or suffer the unbearable sweat inducing hunger that every British person must in preference to taking the last biscuit during a meeting. Even if it is only one of those shortcake ones with the dried currants in. So yes, I am lucky in that sense, but instead my mind is generally preoccupied with a hundred and one other things, some useful, some not – but strangely I’m finding that the more I have to think about the happier a person I am. Curious in a sense, as previously when I found myself in conventional employment, the notion of relaxing and not having to think about anything was a distinct luxury. Now I find it is quite the opposite. Along with the mental chaos that comes of making sure three people are alive, clothed and fed, I have found myself develop a yearning for learning about random things at the moment. In fact it’s become a serious addiction that requires feeding, a nourishment that I crave and never thought I would – a genuine need of ‘thought for food’. This is why I think I have become so fixated with TED.com – I can get a fix of trivia in the time it takes to don a clean pair of socks and dab on a bit of mascara. I think I rather wish I had become addicted to something useful like jogging or hot yoga or something. Then I could have a toned physique and buns of steel! Instead here I sit, cherry bakewell in hand, learning about how the human brain is wired to comprehend our own mortality. Now there’s a delicious irony for you. 5. Inviting a friend to meet me at a local National Trust property. She arrived at said property on time. I also arrived promptly and began looking for my friend at the ticket office (as agreed). It was after some moments of confusion when neither of us could find each other at the modestly sized ticket office, that I realised I had suggested a destination and meant another. My friend was in Basingstoke. I was 25 miles away in Henley-on-Thames. Yep. So I need to come up with a way that I can maintain a working level of mental stimulation without also compromising friendships and causing myself public humiliation and eventually, dehydration. But at least in the short term, my bedroom smells 24 hour fresh.